When University of Arizona law students returned to school in August after a 15-month renovation of their law commons, they barely recognized it. The renewed space, known as the James E. Rogers College of Law, was no longer a dark, dungeon-like building. Instead, it was flooded with natural light and open space, with a renovated law library, classrooms, and various gathering and study spaces. 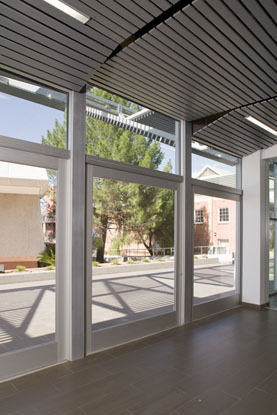 Gould Evans (Phoenix), the architectural firm in charge of the project, helped retain a sense of the original architecture, while modernizing the facility to create a sense of community and reflect the ways students study and interact today. "[The school] really wanted something fresh and different that was uniquely theirs," says Tamara Shroll, project manager for Gould Evans. In addition, the university wanted to create "sticky space," places for students to hang out, which would nurture connections among students and faculty. "By having wide expanses, you can see students across the room and students outside," says Michael Chiorazzi, the College's Associate Dean for Information Services, who managed the project. And while college planners wanted the building to have “gravitas,” according to Chiorazzi, they wanted it to retain its educational identity, rather than taking on the feeling of a law firm. On their way to achieving their goals, the architects found ways to bring natural light in on all three floors, using a central stairwell and light well and by replacing some interior and exterior walls with glass. They also raised the ceilings to further enhance daylighting, using Natura wood ceilings and Box 4 metal ceilings by Hunter Douglas throughout the spaces. "We chose those products very early on in the design process and almost let them guide us in terms of what the space wanted to be," says Shroll. 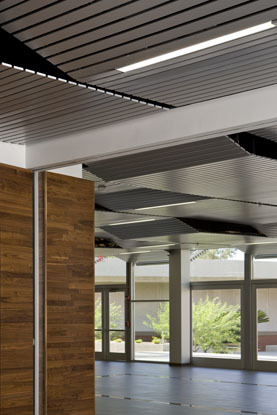 Adds Chiorazzi, the Hunter Douglas products are "responsible for... dramatic changes in the building." 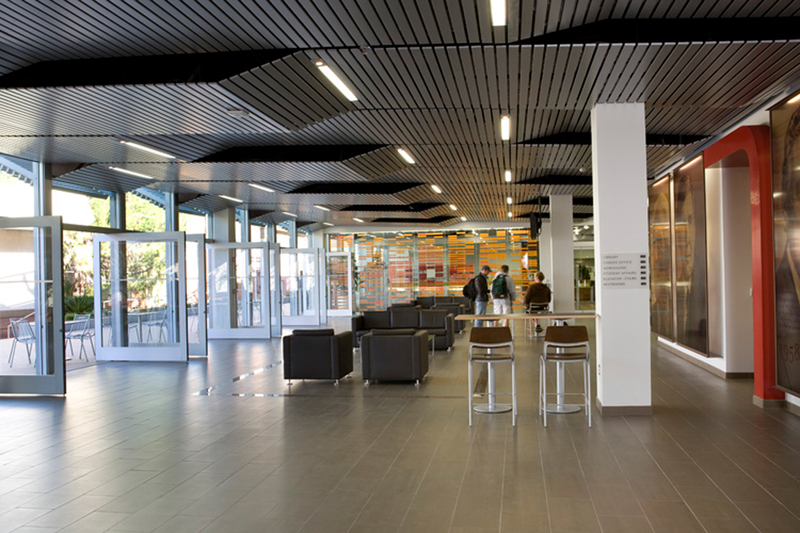 The entryway represents the most distinctive feature of the renovation, and sits at the heart of the one-block law school site that includes buildings for lecture halls, as well as a clinic. Approaching from a new pedestrian walkway through a lush courtyard and patio, visitors walk under a canopy created, whose pitch is echoed inside by the Box 4 metal ceiling. "It looks like the spaces are merging," says Shroll. The blurring of space "brings the outside in," says Chiorazzi, adding that the architects updated the building "in a way that kept it consistent with the original architect's vision," by reinterpreting the shape of the exterior concrete panels as they designed the new ceiling. The seamless connection of inside and out is reinforced by new glass doors that can be opened to create indoor-outdoor events. To create the visually expansive entrance, Gould Evans demolished many exterior pre-cast concrete panels on the north and south sides of the original building, replacing them with glass doors and windows to introduce natural light into the interior first floor, which houses the reference and circulation areas, student meeting rooms, and other gathering spaces. 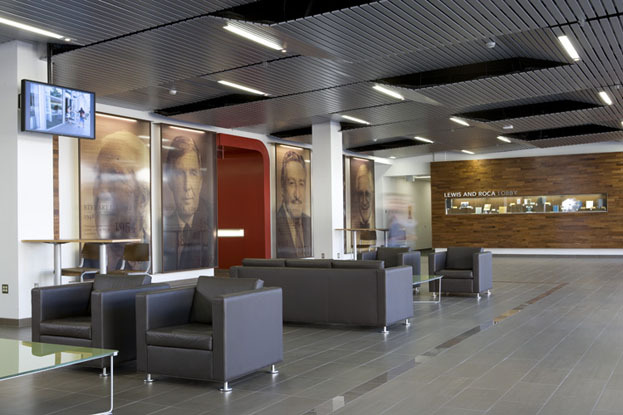 While the law school's first floor has a more modern design, the basement, which houses the heart of the library, provides a quiet, warm environment that Chiorazzi says has an "almost reverential" feeling. This result came through a number of Gould Evans’ modifications, including higher ceilings, the introduction of natural light through a light trough, replacing solid walls with glass for small group study areas, and installation of compact book shelving. 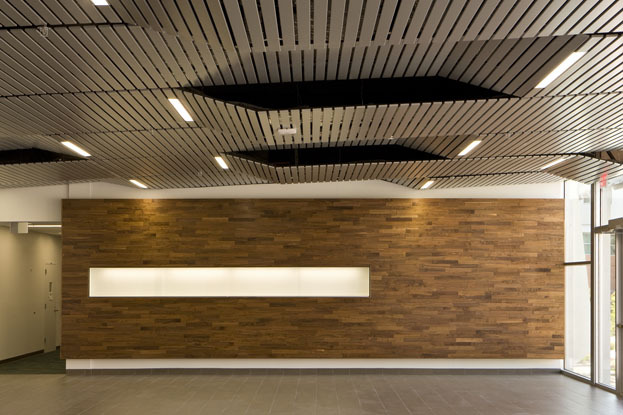 Natura wood ceilings from Hunter Douglas allowed the law school to install an all-wood ceiling at a cost that fit its budget. "Students want to be in there now," Shroll adds. 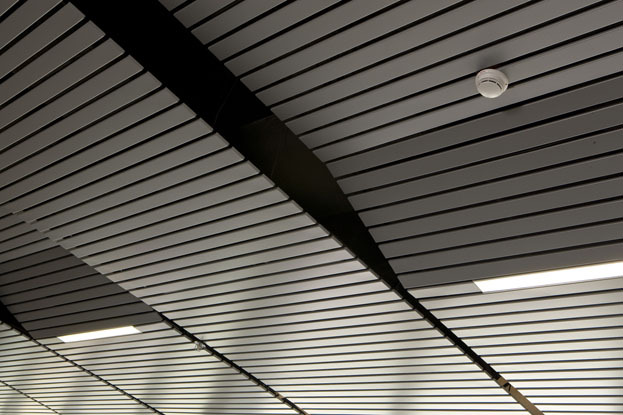 With so much open space, and with hard materials like wood, glass, metal, and tile throughout, sound absorption was key to the specification of the perforated patterns in the wood and metal ceilings. Without them, "you've got a big echo chamber," says Vanosdall. But with them, the sound passes into the ceiling's sound-absorbent backing material and then dissipates into bagged insulation within the plenum. Alumni, students, and faculty have been very pleased with the renovation. Even better, the reborn facility has become a recruiting tool for prospective students. "They come in and see this nice facility,” says Chiorazzi, “and it's easier for them to visualize themselves in it."